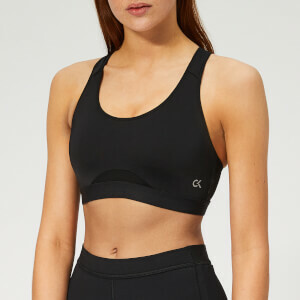 Women's 'Ola' sports bra from high-fashion activewear brand, NO KA'OI. Crafted from soft, stretch fabric with LYCRA® Sport fibres for enhanced comfort and freedom of movement during workouts. Detailed with a V-neckline, cross-back straps and an elasticated under-bust band. Complete with a shimmering silver interior and a triangular logo to the back. Bust darts.